The Country Club of the Crystal Coast sits along the Bogue Sound, sprawling across sand dunes and weaving through the Maritime Forest. At just over 6,000 yards from the back tees, the course doesn't have the length that some other championship layouts have but there are still plenty of challenges in store. Scotch Hall Preserve, formerly known as Innsbrook Golf Course boasts a championship course designed by Arnold Palmer. The layout features 11 holes that border either the Albemarle Sound or Salmon Creek, offering stunning views. The golf course is defined by strategically placed, challenging bunker complexes that border subtly undulating greens that are trickier than they seem. The Inner Banks of North Carolina, situated on Albemarle Sound about 75 miles west of the Outer Banks, is blessed by more than 3,000 miles of inland coastline and charming small villages like Edenton, Windsor and Plymouth. It was one of the first areas in North America to be settled by Europeans, who grew large crops of cotton, tobacco and peanuts. Relatively undiscovered by mainstream tourists, people are often persuaded by others that it's worth the detour to this quiet, laid back part of the Lowcountry. Edenton is the jewel of the Inner Banks. It was the first capital of Colonial North Carolina, so when they talk about "the war" in these parts, it's not about the Civil War, it's about the Revolutionary War. The oldest house was built in 1744 and the handsome brick Chowan County Courthouse dates from 1767. Indeed, it's hard to find a house without history. In Edenton's downtown, there are no chain stores, diagonal parking is free and the tallest building is the old five-story peanut factory. You walk to shops, restaurants and the waterfront or take a short trolley tour. There aren't many golf courses in the area, but there are enough to make it worthwhile to bring your clubs. The Chowan Golf & Country Club just outside town has a stunning setting along Albemarle Sound and although there is water on 15 holes, it's a short, very playable track. If you're looking for upscale, head to Scotch Hall Preserve, an Arnold Palmer Signature Course about 20 minutes from Edenton. Named America's Ninth Best New Private Course in 2009 by Golf Digest, Scotch Hall Preserve, features well placed formidable bunker complexes and excellent bentgrass greens. The par 3s like the 17th running along the water, are especially dramatic with carries over wetlands to elevated greens. Other courses worth playing are sometimes marketed as part of The Outer Banks, but are arguably in the Inner Banks. These include The Pines at Elizabeth City, a Tom Clark design and The Sound Links Golf Course, a Dan Maples design at Albemarle Plantation winding through wetlands, pine forests and moss-draped cypress. Stay in one of the B&Bs like the Granville Queen Inn in Edenton that offers large private baths, thick, comfortable mattresses, WiFi and TV plus incredible homemade breakfasts or book a room in one of the chain hotels typically just outside town. The Inner Banks is perfect for those where the surroundings and history are as important as golf. It is in Plymouth that the last Confederate victory took place during the Civil War and it is at a dock in Plymouth were the ironclad CSS Albemarle warship sank in 1864. American Civil War buffs can visit the Port O'Plymouth Museum in Tarboro and Hope Plantation in Windsor are open to the public. The Inner Banks is not that far from Myrtle Beach or the Outer Banks but it's worlds away in mind-set so don't look for a rousing nightlife. People go to bed early and the loudest thing you may hear after 10 p.m. are the wind chimes on the porch. But if you want to play some golf, experience the charming quirkiness of small towns, hang out on porches, go kayaking through the marshes and eat oysters at local seafood restaurants, you've come to the right place. To come here to Edenton, N.C. to stay and play golf you have to really appreciate history and all the laid-back quirkiness of small towns. You have to want to come here. In Edenton, you walk to shops and restaurants, walk to the water. You hang out on porches and go kayaking or canoeing. 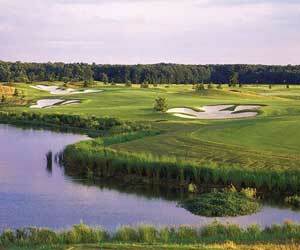 There is also golf, with fine courses such as Chowan Golf & Country Club and Scotch Hall Preserve.